Perfect for the last few weeks of summer! Today marks Jennylyn Mercado's 30th birthday! 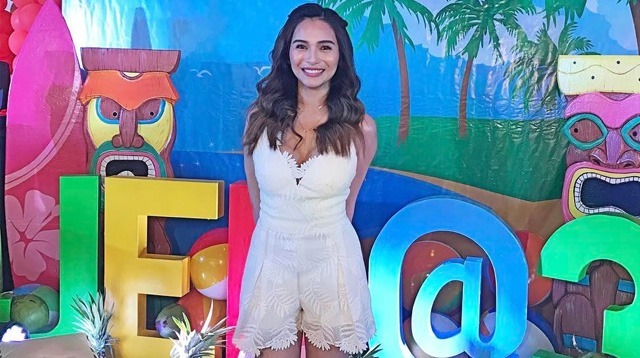 The Kapuso actress has been busy shooting her new drama series My Love From The Star, but she took time off during the weekend to celebrate turning the big 3-0 with a tropical-themed birthday bash! Jen's pool party was decked out with colorful balloons and floaties that look straight out of Pinterest. She was also caught LOL-ing when her ~*entertainment*~ came out to dance with laser lights. LOLS. ICYDK, Dennis celebrated his 36th birthday the night before Jen's party. The intimate gathering was held at home with close family and friends.